The 45th edition of the International Film Weekend Würzburg was the most visited since the move to the Central Cinema: For the first time more than 10,000 film fans visited the traditional festival, which has grown to a new size by adding a new, sixth venue. The festival’s popularity with its fans proves that the collective experience is still an indispensable part of cinema culture. 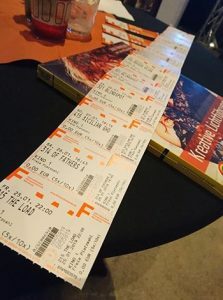 Already in the run-up to the festival, the multiple ticket passes were sold out. Most of the evening performances were fully booked. This also applies to the films that were shown at the Vogel Convention Center, where the film initiative had set up a cinema hall with around 350 seats – by far the largest of the festival. The special formats “Die Selbstgedrehten” and “Kammerflimmern”, in which Würzburg pupils and students showcase their self-produced films, also enjoyed great popularity. The most watched film was the Irish production “The Drummer and the Keeper”, which also won the Audience Award. Director Nick Kelly insisted on making music together with a band from Ireland playing at the festival. The films “Womit haben wir das verdient?” (Austria) and “Kelebekler” from Turkey also recorded great viewer numbers. The silent film matinée on Sunday morning was sold out as well.